Approximately 70 beads in each mix. 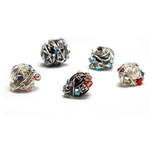 We search the world over for very high quality small Bali style beads in interesting shapes and designs. 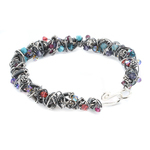 I also mix in some interesting Thai Silver beads. Sometimes the Thai Silver beads come a bit "dirty" so I polish and tumble them before adding them into these mixes. The beads in this mix are approx 5mm and smaller in size. 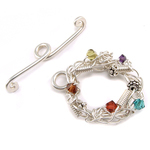 The specific beads in this pack will vary from time to time based on availability. The mix may or may not be exactly like the one pictured above. Remember, "Bali Style" is now a term to describe the bead style which originally came from Bali, but now "Bali Style" beads may come from India, Bali, Turkey and various other markets. I don't buy the cheap cheap beads, those are typically oxidized poorly with poor silver quality.